Taxonomies systems for naming and organizing things into groups that share similar characteristics. Initially emerging from Biology and Library Sciences, we increasingly tend to use Taxonomies for describing the outcome structure of buildings, or for labeling the navigation system of a given application. Within a given application’s information architecture, we use taxonomies to replace the general term group with the category or menu group and arrange all the “things” according to their actions, features or items. There is no right way of doing a product taxonomy. Often there are several kinds of representations that product taxonomies adhere to, each created to represent all the different needs of all the different user types one is targeting. These decisions take into consideration any known cultural differences, age differences or group dialects among your target audience. Taxonomies therefore should also be revised when the product evolves to accommodate new functionalities and changes in focus or use value. Taxonomies are mostly used in large information structures such as libraries, document repositories, or knowledge management systems but they should also be developed when designing your Minimum Viable Product’s user interface. Both large and small information structures need to have a good taxonomy that best represents the operations available to the user within a logical structure. Take for example the menu system of most Document Editor applications. In word processor applications there is, across the top, a menu arrangement that includes the list of all possible operations which are arranged under specific labeled categories, where each category label is meant to be a representation of all the included operations and each single operation within the category, and where each has its own unique and distinct label. Eventually all products will need to have a well determined taxonomy that best represents the labels and categories of their information structure. This structure needs to be decided upon in a clear and unambiguous way, because without it the user won’t easily find the buttons or the tool he needs and will make it difficult for him to understand even where to look for it. Developing a good taxonomy starts by understanding which items need to be arranged, and secondly, which groups they need to be separated in, because there are categories which are mutually exclusive, unambiguous, and or taken together, and because their labels have include all the possibilities of the user experience. In practice, a good taxonomy is a structure that is easy for the user to remember and even easier for him to use. The important thing to remember is that you need to put a considerable amount of effort into labeling both the categories and the items within each category on your interface. Good labels for categories will help your users understand what is included under the category and also what differentiates it from other categories. Ambiguous labeling causes quick in-and-out behaviors, because users will be spending their time searching for the right location of a specific item. Sometimes you can observe the same “in and out” behavior repeatedly, even after a user has been using the product for a long time. When the labeling is not clear, users will keep spending time trying to locate the same category for the same features they’ve already used before, which is a behavior that demonstrates a poorly developed taxonomy. Finding the right labeling also means understanding your target audience better. Specifically, you need to know more about their perceptions and comprehension of your taxonomy and carefully choose which set of labels they can adapt to. Sometimes there are terminologies that we use that tend to have a slightly different meaning depending on a person’s age, culture, professional background, etc. Within a given set of product categories, the more important items you have should to be given more importance than others. Sometimes particular labels deserve to be given their own unique real estate within the user interface. There is also a need for highlighting such items simply because each product has its common use cases and its own set of commonly performed operations, all of which are linked according to use case. By highlighting these important items and, likewise, by placing them in an easy to see and use location within the interface, the user will be able to perform his most important use cases within a shorter amount of time. One method of highlighting items can be achieved by creating shortcuts from within the categories and placing those shortcuts in a visible place. But this is only one example, there are many more aspects to consider when building your product taxonomy, and there is a need for your to use an expert for advice when creating one. 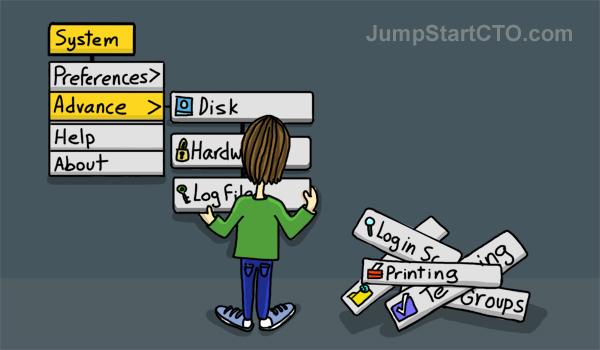 When designing your Minimum Viable Product, invest some effort in mastering everything about the user experience. Invest you time in planning and creating the product taxonomy early, especially when the number of features your product is offering is still relatively low. Even though this might seem like a time when there is no need for a well developed taxonomy, but when you take into consideration the whole lifespan of your product, doing it now rather than later is proven be the best approach. Introducing a good product taxonomy from the start ensures that it will already be there when you later add more functionality to your Minimum Viable Product. Finding the correct placement for your categories early will be easier to do now, because further on you might end up having to restructuring the product interface all over again to frequently accommodate additions as they happen. I use several tools when it comes to planning and communicating the product taxonomy. These tools help to visualize your taxonomy clearly and aid you as you easily move items and sub-categories from one category to another one. 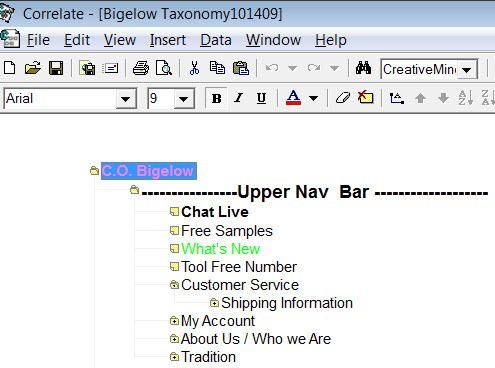 Using a text editor and word documents can also help in planning the product taxonomy, but there are better tools like Mind-Mapping software or Unique Taxonomy creation tools that help considerably in this process of building one’s taxonomy. 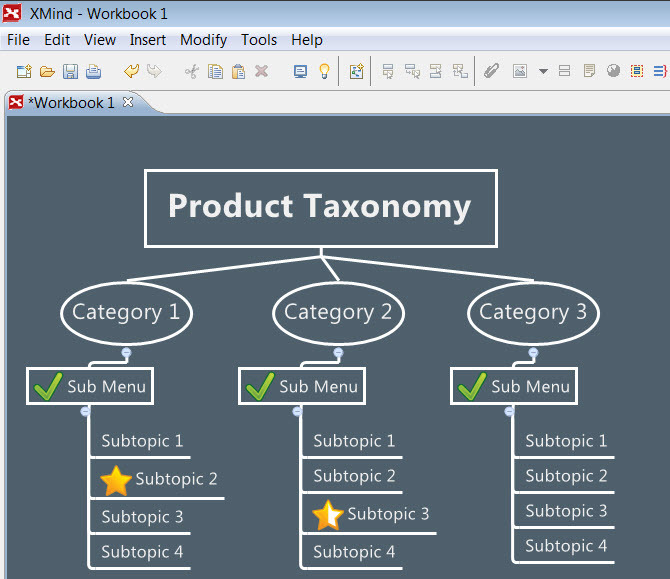 Xmind is one example of a mind-mapping software which easily lets you build taxonomies and manipulate them. Product taxonomies ought to be tested with real users before they are applied in the product interface and especially before the product is developed. Like in older posts, our approach is that user testing is a basic part of building your Minimum Viable Product. There are known methods for validating the product taxonomy with real users, they are generally named Cart Sorting (Read more in WikiPedia) like the Delphi Card Sorting . There are also many online tools for Remote Card Sorting like The Mind Canvas, OptimalSort and WebSort. Product taxonomies are an important aspect of planning and arranging your product offering. It is yet another way that makes it easier for a user to find and use your interface. When developing your Minimum Viable Product, it is important to plan your product taxonomy from the start, and not wait until after it is more mature or already launched. This will help you to avoid frequent needs to change the user interface. Remember to test the product taxonomy with real users that represent the product’s real target audience and, in turn, make adjustments based on their user feedback. Clear Taxonomies are the most helpful way to explain what the product offering is and how the user can utilize your product in the most efficient way.